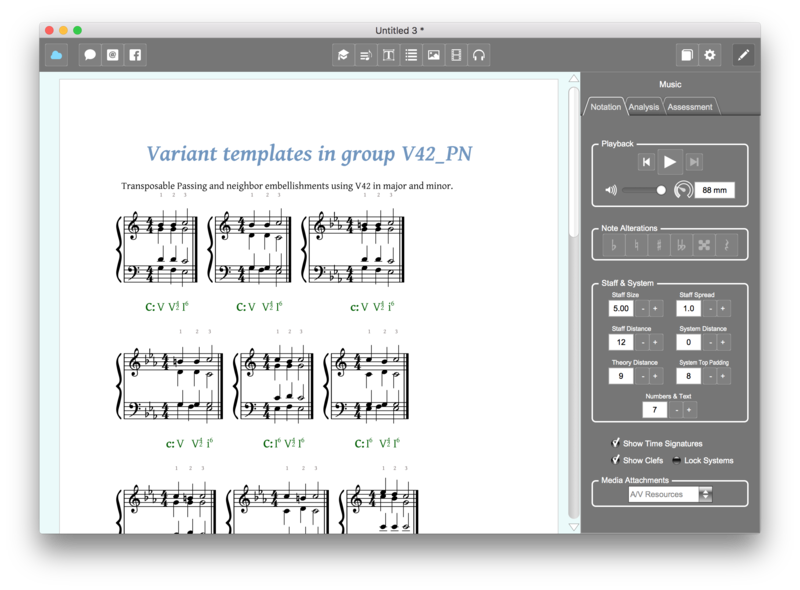 Harmonia contains a collection of powerful score generators that quickly create musical scores for use in interactive Harmonia documents. The generators provide the ability to control exactly what materials are generated, in the desired clefs and keys. Once added to a document, generated scores can then be edited and converted into a variety of different assessment types. To use the generators, first log in with a teacher's account. Once logged in, click on the Teacher icon to install the score generators in the edit panel on the right side of the window. The Pitch Generator generates scores suitable for creating pitch and pitch-class composition and analysis assessments. 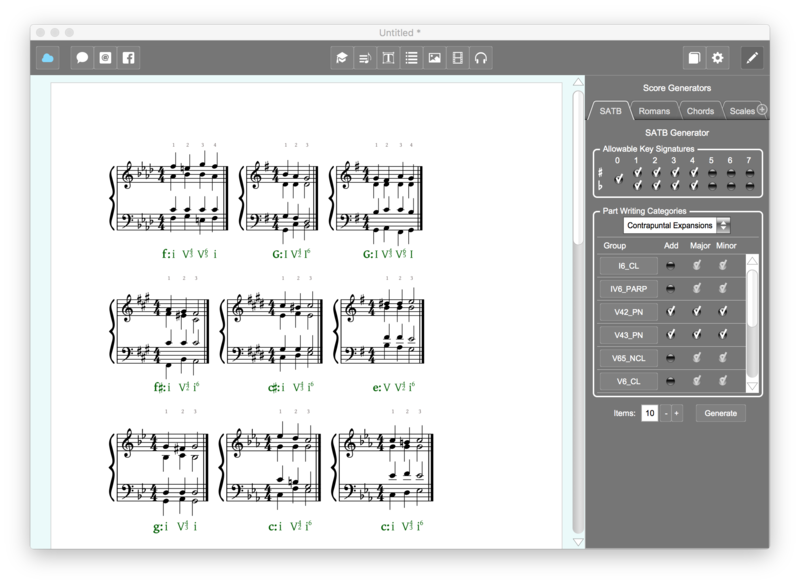 Use the generators to create examples for lessons, identification and notation exercises, and more. Staffs & Allowable Clefs - select the number of staves to be used (only one staff is available for pitch scores) and select the clefs to appear in a generated score. Choose from treble, bass, alto, tenor, baritone, mezzo, and soprano clefs. If more than one clef is selected, Harmonia will randomly choose one clef per score. To make the generator randomly choose a new clef for each measure, select Clefs Each Measure. Allowable Accidentals - customize what kind of accidentals may be used in a score. Select from None for pitches with no accidentals or choose pitches with sharps and flats, or pitches with double-sharps and double-flats. Generate Items - once you have customized your score content, specify the number of score items to create with the Items slider and press the Generate button to add them to your Harmonia page. The Interval Generator generates scores suitable for creating composition and analysis assessments and lessons pertaining to intervals. Staffs & Allowable Clefs - select the number of staves to be used (1 or 2) and select the clefs to appear in a generated score. Choose from treble, bass, alto, tenor, baritone, mezzo, and soprano clefs. If more than one clef is selected, Harmonia will randomly choose one clef per score. To make the generator randomly choose a new clef for each measure, select Clefs Each Measure. Allowable Intervals - specify the exact intervals to appear in a score. Select from diminished, minor, major, augmented, and perfect interval qualities in sizes ranging from 1-12 (unison - twelfth). Keep in mind that all scores may be edited in Harmonia, so you are not limited to the generator's size and quality choices. The scale generator generates scores suitable for creating composition and analysis assessments pertaining to diatonic modes and scales. Staffs & Allowable Clefs - select the number of staves to be used (only one staff is available for scale scores) and select the clefs to appear in a generated score. Choose from treble, bass, alto, tenor, baritone, mezzo, and soprano clefs. If more than one clef is selected, Harmonia will randomly choose one clef per score. 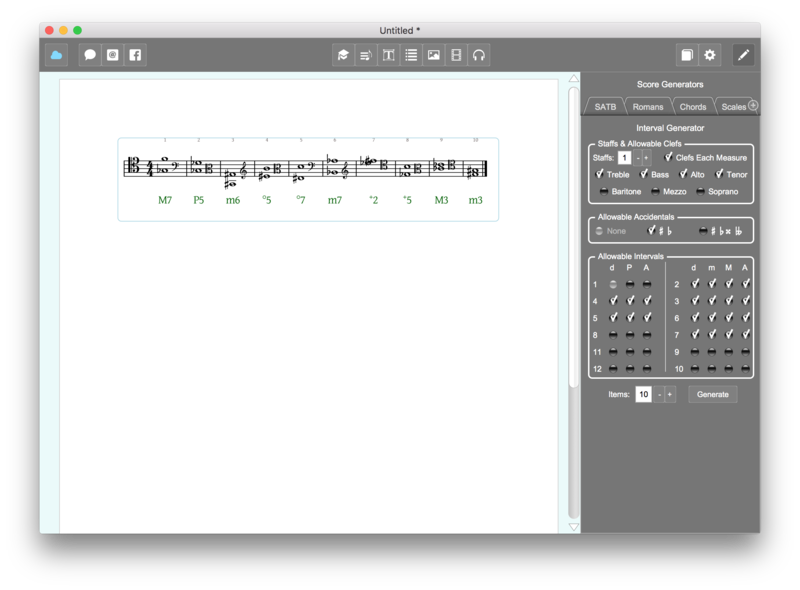 To make the generator randomly choose a new clef for each measure, select Clefs Each Measure. Allowable Key Signatures - specify the exact mix of key signatures that can appear in the score. On the top row are sharp-key signatures and on the bottom row are flat-key signatures. Limit the available key signatures by selecting the preferred number of sharps or flats for each key signatures. Allowable Scale Forms - specify the exact kind of scale forms that may appear in the score. Click Major for major, Nat.Minor for natural minor, Mel.Minor for melodic minor, and Har.Minor for the harmonic form of the minor scale, or choose from one of the diatonic modes. Select Include Octave Note to include the tonic (scale-degree 1) one octave above each scale's starting pitch. Generate Items - once you have customized your score content, specify the number of score items to create with the Items slider and press the Generate button to add them to your Harmonia page. Note: all scales are notated in ascending form. Once the scales are added to your Harmonia page, you may edit the pitches to notate descending scales if desired. 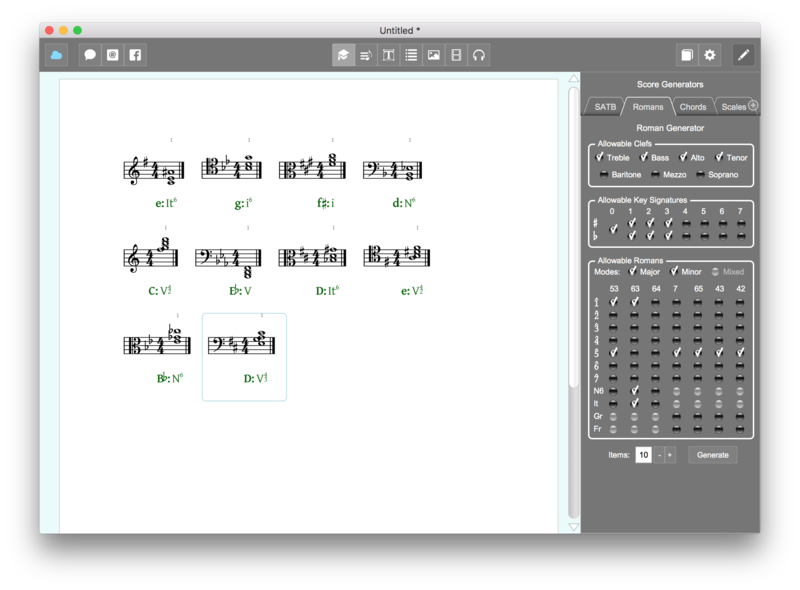 The Chord Generator generates scores suitable for creating triad and seventh-chord composition and analysis assessments. Use this generator for learning and practicing chord spelling and identification as well as figured-bass symbols and inversions. Staffs & Allowable Clefs - select the number of staves to be used (only one staff is available for chord scores) and select the clefs to appear in a generated score. Choose from treble, bass, alto, tenor, baritone, mezzo, and soprano clefs. If more than one clef is selected, Harmonia will randomly choose one clef per score. To make the generator randomly choose a new clef for each measure, select Clefs Each Measure. The Roman Numeral Generator generator is similar to the Chord Generator, but provides a tonal context. It is suitable for creating chordal composition and analysis assessments dealing with roman numerals and key identification. Allowable Clefs - select the clefs to appear in a generated score. Choose from treble, bass, alto, tenor, baritone, mezzo, and soprano clefs. Allowable Romans - specify the exact kind chords to add to the score. 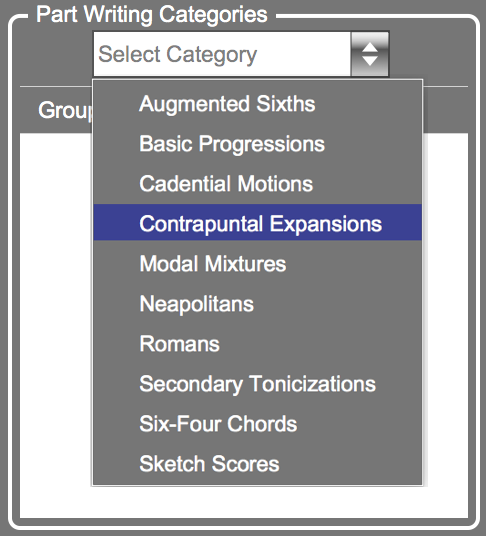 Use the Modes line to select the allowable tonal contexts for determining scale degrees and chord qualities. Select Major and or Minor to generate diatonic chords (or common chromatic chords) in major or minor keys. Select Mixed to generate mixed-mode or borrowed chords. For diatonic or mixed-mode harmonies, choose from triads or seventh chords by scale-degree roots and desired inversions. Additionally choose from common chromatic harmonies such as Neapolitan (bII) and augmented sixth chords. Generate Items - once you have customized your score content, specify the number of score items to create with the Items slider and press the Generate button to add them to the Harmonia page. The SATB Generator generates scores suitable for creating composition and analysis assessments. Use the SATB generator to create four-part, chorale-style part-writing and roman-numeral-analysis examples and exercises. The generator is based on transposable SATB score templates so it is both customizable and extensible. The Part Writing Categories control group maintains an extensive list of score categories. Each category contains groups of variant scores that may be transposed and added to a Harmonia page. To select score groups, start by clicking on the Select Category pulldown menu to choose a category of score examples to browse. Selecting a score category from the menu will install a list of score groups into the Group view box below. Each score group contains a set of "equivalent" scores that vary in terms of mode (major/minor) and voicing (open/closed). The controls in each row allow you to inspect and select/filter the scores belonging to that group. Hover the mouse over the group button to show information about the scores in the group. Click the group button to open a new window showing the variant scores in the group (see next image). Click the Add button to include the group in the generation process. Note that more that one score group may be selected for inclusion. Use the Major or Minor toggles to include/exclude scores in major or minor modes. For example, click on the V42_PN button to display all the variant templates in that particular group. This group features the V42 chord in a variety of passing and neighbor contexts. Note that all template scores are defined in terms of C Major and C Minor and then transposed to selected keys as they are generated. Generate Items - once you have customized your score content, specify the number of score items to create with the Items slider and press the Generate button to add them to the Harmonia page. Scores from each added group will be randomly selected, transposed, and added to the page. Note that the transposition actually generated for a given template depends, in part, on the voicing of the template. For SATB templates that span wide distance (e.g. 2 or 3 octaves) transpositions will be limited by the allowable ranges of the bass and soprano voices. 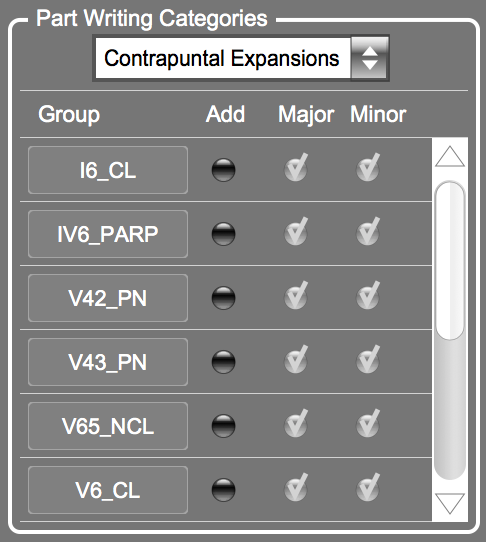 Clicking the V42-PN and V43_PN buttons display the variant templates in the groups in keys containing 0-4 sharps and flats. Once you generate a score and add it to your page you can alter it by dragging notes, changing accidentals, etc. As you edit the score the green theory line below will automatically adjust itself to conform to the edited score. Turn your document into a lesson or exercise using the buttons at the top of the Harmonia window to add text, images, videos or other scores. Once the document is ready, convert your scores to assessments, and then save and upload the document to the Harmonia Cloud, where you can add it to your course and configure how and when the material will be available for your students to download. A quick tip: to easily navigate Harmonia's detailed automatic feedback and to easily pinpoint and diagnose student errors, consider creating documents with a minimal number of assessable tasks. For example, most pre-made assessments available for use in the Content Library feature very few, short exercises, which can be linked together into a single homework assignment or concept module. So rather than adding 5 exercises to 1 page, consider creating 5 pages each containing a single exercise.